10:20: (pics 01-04): Hi Brian and Gary, here are some photos from one of the displays at the Great Lakes Carnival Glass Convention. 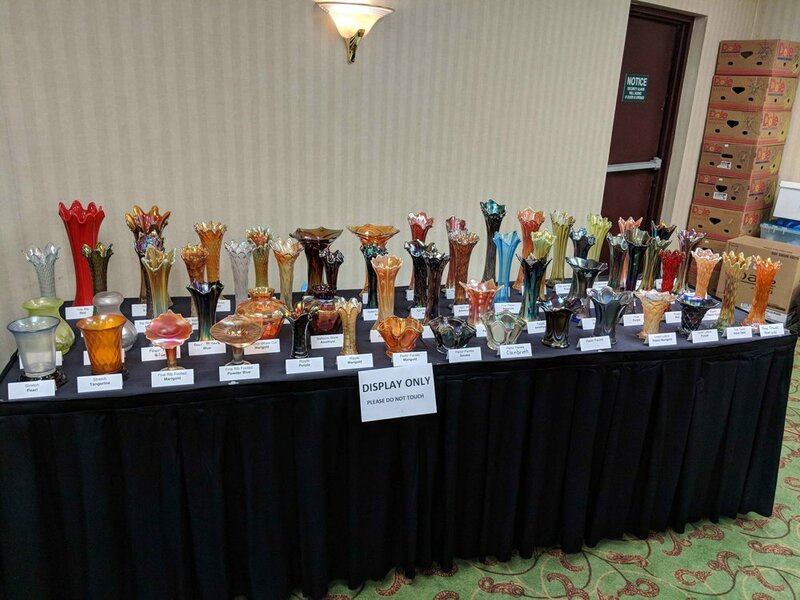 This display features pairs of vases which are the same mold but with a different top treatment or in a different color or some other different aspect. There are about 100 pair of vases and include carnival, stretch and various other types of glass. 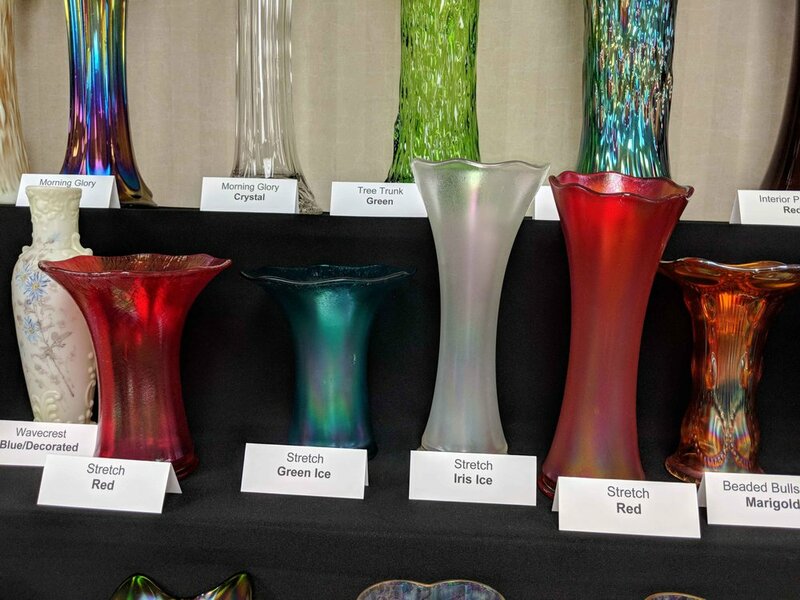 Several SGS members loaned stretch glass vases for the display providing a very nice selection of stretch glass vases. 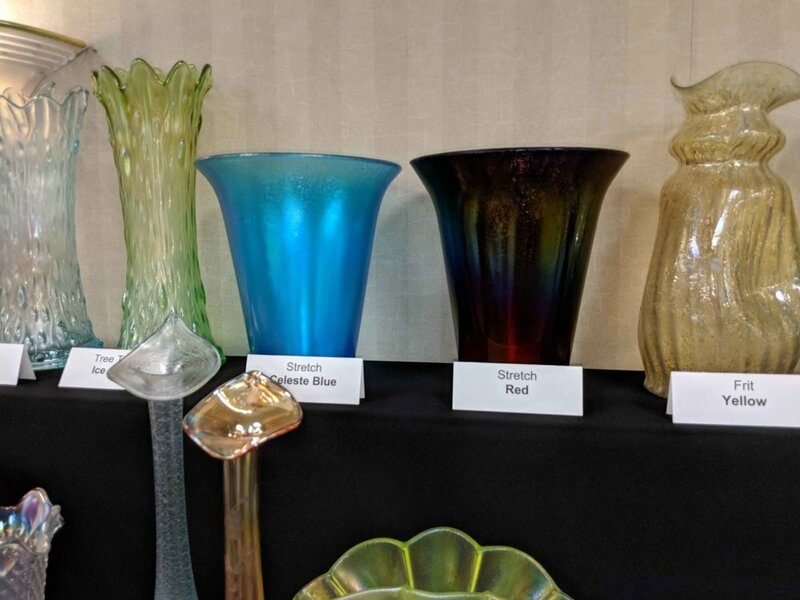 We thank the Great Lakes Carnival Glass Convention for including "our" vases in their display. 10:32: (pic 16): I think that is it. I tried to get close ups of the stretch glass pairs. Thanks. I'm speaking at the banquet tonight. I'll try to send photos of my glass display once I have it set up. We have to pack up the vases before I can set up the glass for my talk. 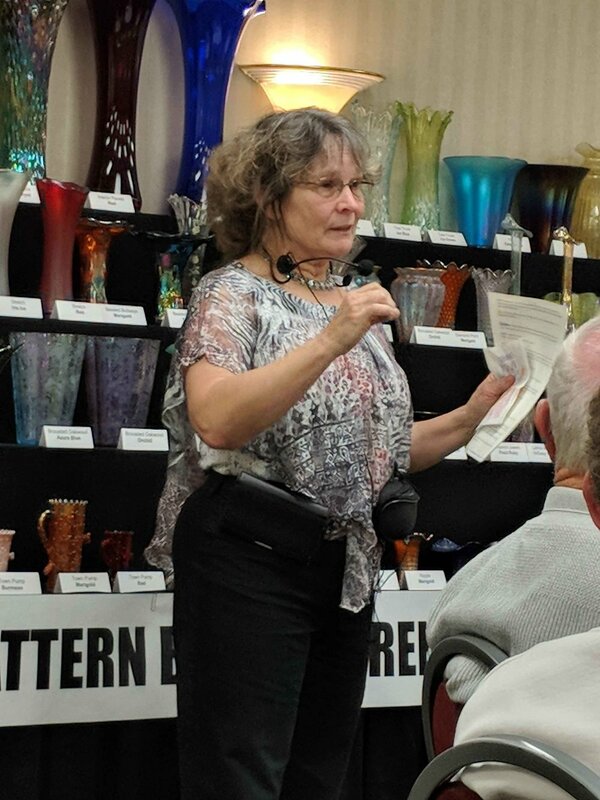 14:12: (pics 17-18): Here is SGS director Kathy Johnson talking about the vase display. SGS member Galen Johnson also participated in the presentation. 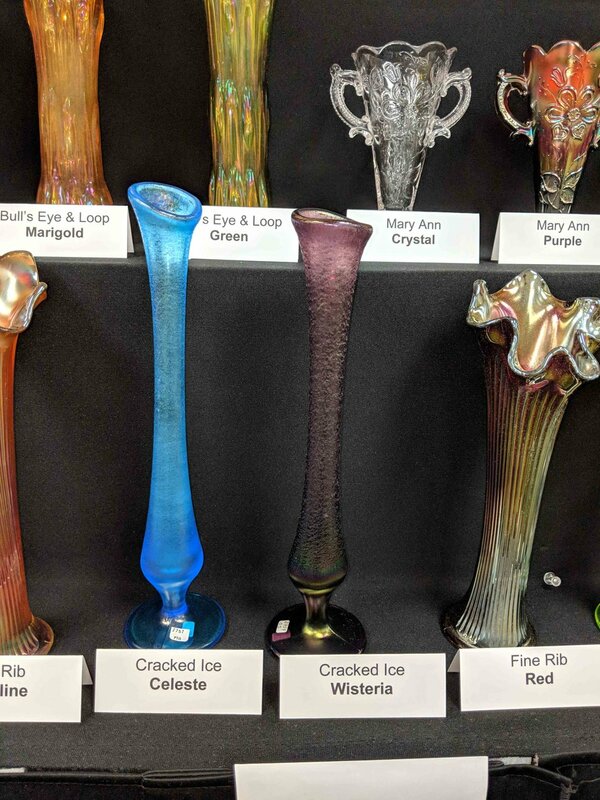 17:08: (pics 19-23): (subj: Stretch glass: Something for everyone and (almost) every occasion) Tonight I'll be speaking to the Great Lakes Carnival Glass Convention about stretch glass. The display I have with me is approximately 200 pieces strong. It includes rarities, hard to find pieces and a few common pieces of stretch glass. During the course of my talk we will explore the 9 companies that produced stretch glass, the range of colors in which it was available and the peculiar and interesting shapes in which it was made and used for everything from flower arrangements to butter balls, nuts, mayonnaise and sherbet. A video of the presentation will be available at a later date. If you and your glass club would like to learn about stretch glass please contact The Stretch Glass Society to arrange for a presentation and display if stretch glass. Contact us at info@stretchglasssociety.org.